We don't stress it enough: it is vital for any e-Commerce targeting the Chinese market (whether based in China or not) to integrate the local preferred payment methods. It's great to have Visa and Paypal but don't expect your online shop to take off with only these. In China, Union Pay, Alipay and WeChat wallet rule. We recently worked on an e-Commerce project involving Wordpress and thus WooCommerce plugin. The issue was that although WooCommerce offers an extensive range of payment options, it does not provide any comprehensive module that includes both Chinese and international payment gateways. And what is likely to be one of China's most complete payment gateways? Yoopay. It integrates both Chinese and Western most used payment means and can handle both RMB and foreign currencies, in and out. Union Pay, Alipay, WeChat Pay, Visa, Master Card, American Express, Paypal - you name it. We started to look around but no bridge existed between WooCommerce and Yoopay. So we simply decided to create one in-house, and share the module with the community. We contacted YooPay and told them about our little project. 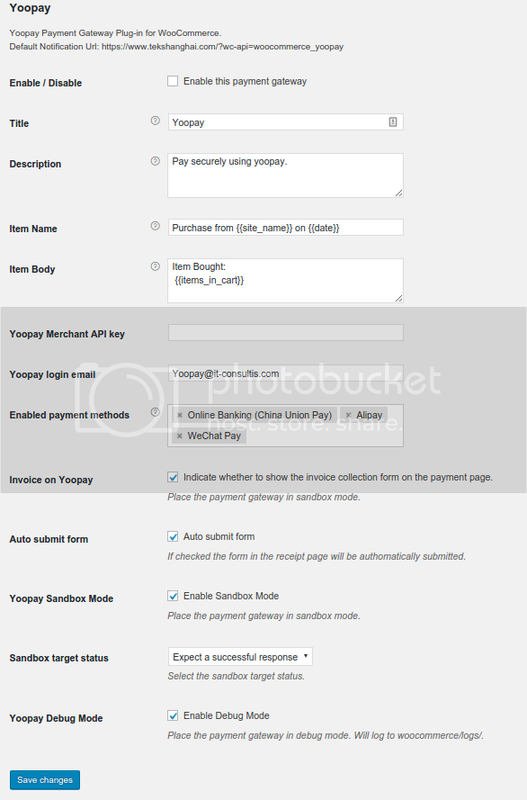 The great thing about Yoopay is that they make things quite easy for developers. Their API delivers what they promise on their website, and we managed to work along with their sandbox (which was in our experience, a much smoother process than working with WeChat's or Alipay's sandbox). The Yoopay team was great too. They were reactive and provided us with clear and detailed answers whenever we had more technical questions that were not covered in their tutorials. It took us a few days to develop this custom module for our client and we are proud our little guy has been chosen as an official plugin. The payment module can be used on any WooCommerce project, it is on Github and in the Wordpress plugins section so feel free to try it by yourself. Last, we could also adapt the payment module we've created to other technologies, say Magento, Drupal, etc. On a side note, Wordpress is a great user friendly CMS for those who want a simple content focus website. However for e-Commerces, our preference goes to Magento as it is much more scalable and customizable.